Balkan Rhythm and Dance consists of two events that have become a staple for my Balkan Folklore class (SOSL 268/368, NEHC 20568/30568, CMLT 23301/3330, ANTH 2/35908). The leader of the Chicago-based ensemble Balkan Dances (Balkanski Igri), John Kuo, who also happens to be a University of Chicago alumnus, gave a lecture and demonstration about the music and dance rhythms in Southeastern Europe. 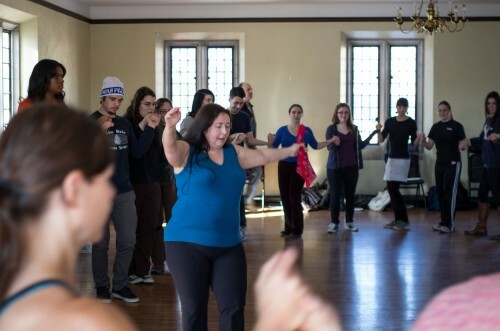 The lecture was followed by a beginner’s dance workshop in which the members of Balkanski Igri taught the students the steps of some of the simpler circle dances. Founded in 1964, the Ensemble Balkanski Igri was an outgrowth of the University of Chicago Folk Dancers and is dedicated to the research, teaching, and performance of the folk music and dance of all regions of the Balkansand Eastern Europe. The ensemble also produces concerts and provides logistical and community outreach support for concerts of such major artists as Esma Redžepova the “Queen of Romani (‘Gypsy’) Music”, Boban Marković “Golden Trumpet of the Guca Festival,” Goran Bregović, Ivo Papazov, Teodosi Spasov and others. The Ensemble co-sponsors an annual Spring Festival each Spring the University of Chicago’s International House. While the city of Chicago is lucky to have at least ten folk dance and music ensembles representing the traditions of Southeastern Europe, most of them focus on single national traditions (Bulgarian, Macedonian, Serbian, etc.) I have chosen to establish this class tradition with John Kuo, who leads the only ensemble I know which teaches and performs dances from the entire region, including Romani. John’s philosophy in approaching the folk material aligns best, in my opinion, with the objectives of my course. This year the lecture and workshop took place on Sunday, March 3. Thanks to the support from Arts Planning Council, CEERES, the College, the Slavic Department, and the Music Department, the event was a tremendous success. We had over 50 people in the audience for the lecture (we had to bring extra chairs) and over 60 for the dance workshop. John brought rare folk instruments from his own collection, instruments made by masters in the Balkans who are no longer working. He allowed some students to play on these precious instruments. Especially interesting were the two kavals (shepherd’s flutes), made in the different traditions of two separate regions. 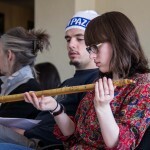 Drawing a sound fro these shepherd’s flutes is quite a challenge, but one or two of the students managed to do that. John also demonstrated the unique musical rhythms of different areas in the Balkans both by playing the instruments and by tapping and showing basic steps, and by playing examples with increased complexity of rhythm from his enormous music collection. He taught the students how to recognize and understand the rhythms. He started by telling them that the rhythms follow that of the heart – quick-slow—and that the Native Americans have a very similar rhythm which they call the heart rhythm. For those who participated, John had prepared special CD gifts. 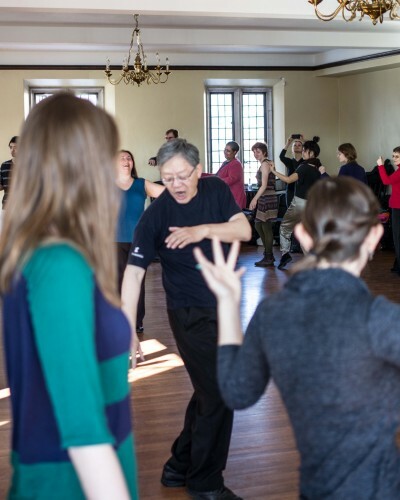 As an added bonus, John’s wife Galia Kuo, who was professionally trained folk dance in Bulgaria, helped with the lecture and the workshop. The dance workshop was also very successful. Each of these dances was introduced by a brief explanation of the specific area from which it comes, as well as the contexts in which it is performed. The instruction was very successful and by the end of the hour, most students were comfortable dancing alongside the ensemble. Thanks to the support I received, I was able to host a reception for the students and the ensemble members after the dance. I am enclosing the poster for the event, as well as photos that a professional photographer, Steve Gubin, who loves Balkan Dances and often blogs about them, took at the event. This entry was posted in Archives and tagged dance, special events by Admin. Bookmark the permalink.